You can create your own HubSpot templates to ensure your auto-created webinar pages are fully on brand. Once you have followed the steps below you will see your new template pack as an option to use within your WorkCast account. Specific module types within these HubSpot templates will need to contain correct 'tags' (snippets of HTML) to ensure event items such as the title, registration form, media player and attendee joining details are automatically added to your pages. Within HubSpot, create three landing page templates within their own folder, with the titles named EXACTLY as below. If you already have landing page templates you wish to use for your webinar template pack you can clone existing templates to create the new webinar template pack. In your HubSpot Marketing account, navigate to Marketing > Files & Templates > Design Tools and locate the landing page template(s) you wish to clone. You must ensure your three templates contain all the modules listed below to ensure the auto generated webinar elements will be populated inside these modules. This means when you come to create a HubSpot event from the WorkCast Platform the form, joining links and media are all auto populated inside these modules in three automatically created landing pages. In your HubSpot Marketing account, navigate to Marketing > Files & Templates > Design Tools and locate the template named 'WorkCast Webinar Registration Landing Page'. You will now need to ensure the three modules for Event Title, Event Date and Form containing the following custom wrapping HTML are included within this template. In your HubSpot Marketing account, navigate to Marketing > Files & Templates > Design Tools and locate the template named 'WorkCast Webinar Registration Thanks Page'. You will now need to ensure the three modules for Event Title, Event Date, Join Event, Test Connection and Add To Calendar containing the following custom wrapping HTML are included within this template. In your HubSpot Marketing account, navigate to Marketing > Files & Templates > Design Tools and locate the template named 'WorkCast Webinar Event Landing Page'. You will now need to ensure the three modules for Event Title, Event Date and Media Embed containing the following custom wrapping HTML are included within this template. Once your three HubSpot templates are created in their own folder and named as required you should then see your template pack as an option to create an event from! 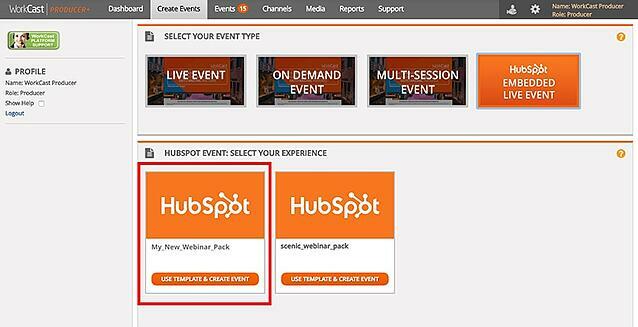 Navigate to Create Events > HubSpot Embedded Live Event, enter your event details and you're away! Three landing pages will be automatically created in HubSpot in the layout of your templates, along with a basic webinar workflow that ensures the registrations are pushed to WorkCast to trigger the confirmation emails. You don't need to worry about pasting event embed code, adding joining link URL's or creating landing pages; it will all be taken care of for you!